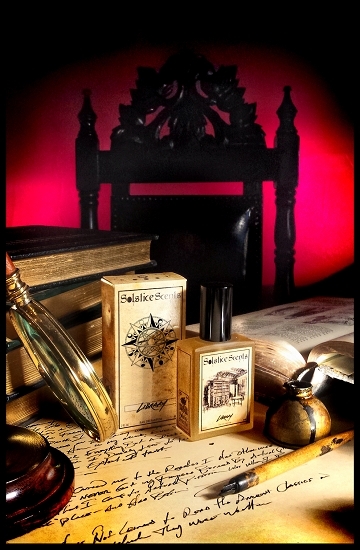 Library begins as a robust woods and leather (brown and black) scent with strong smoky overtones on initial application. Allow it to morph and settle after a few minutes as it begins to soften into a realistic and complex fragrance that contains elements you'd expect to experience in the fine personal collection of the Manor. Library contains a blend of sandalwood EO and FO, agarwood, nagarmotha EO, choya loban attar, guaiacwood, Virginia cedarwood EO, leather, copaiba EO, benzoin EO, rosewood EO, Plai EO, western red cedar EO, rhododendron leaf EO, osmanthus attar and fragrance oils. The dry down features a combination of woods, leather, embers, dust and brittle paper with a rich lemony-rosewood finish. The 60 ml EDPs are not currently available for international shipping. The 3.3 ml EDP sample sprayers are.